In this spread, which appeared in England's gay magazine Attititude, a handsome man carries the headline, "You think your face will turn him on. He thinks the grease on your face is a turn off." This campaign appears to be the first worldwide introduction of a brand into gay markets simultaneous with mainstream markets, in the US and UK. 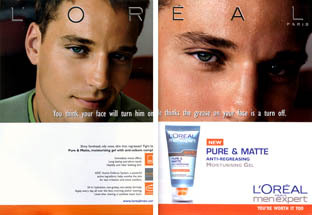 A variation of the creative appears in general magazines with a tweak to the copy line, switching "he" with "she."